Your composition should occupy most of the paper’s surface. How much negative space do you have left? 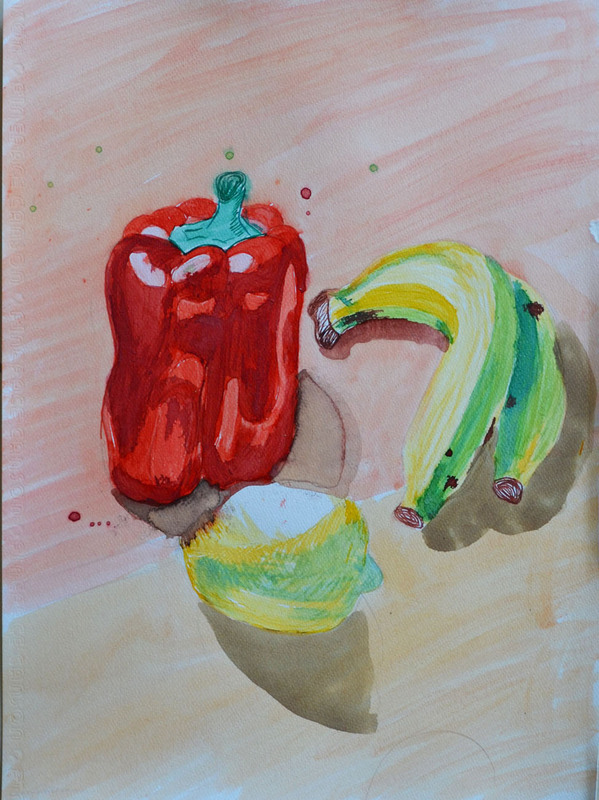 I think I did really well with all the three exercises of this project, ‘Using Hatching to Create Tone‘, ‘Using Markers or Dip Pens‘ and ‘Drawing Using Oil Pastel‘. In all three final drawings I left minimal negative space allowing for shadows and props used. 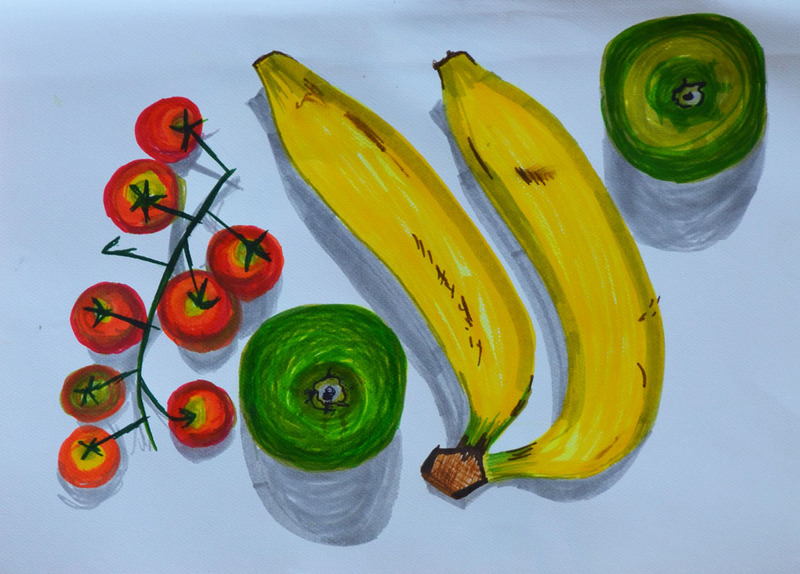 What have you learnt from drawing the details of fruit and vegetables? 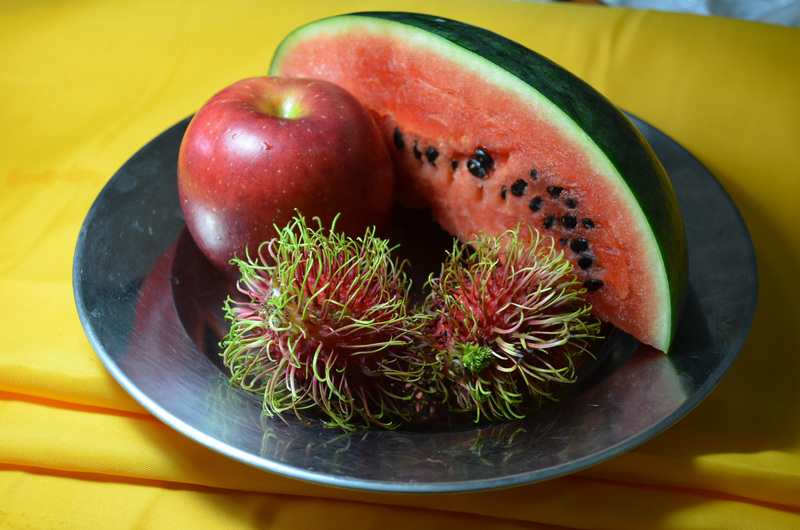 All fruits and vegetables have different surfaces from smooth and shiny to rough, hairy and spiky so every object is a challenge not only this but its very difficult to get familiar with the shape of a certain fruit or vegetable as the surface differs from one to another taking into consideration ‘ripeness’. What did you find most challenging about this part of the course? Firstly, I really had problems using dip pens and creating tone with this medium it is something I really have to work hard at getting as much practise in as possible. 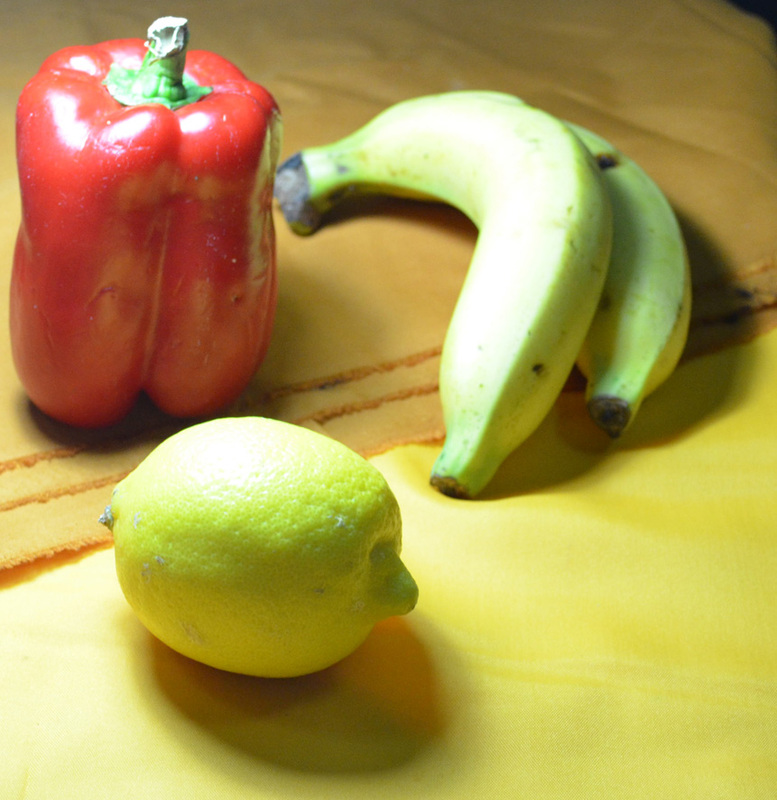 Secondly composition arrangement and that arranging a composition with fruit and vegetables takes more time than arranging other objects; not only for fear of repeating a similar composition you drew in a previous exercise but for fear of arranging a composition that will not allow you to capture the full details of the objects. For this exercise I used approximately 13 different colours of oil pastel and a white textured sheet of A3 watercolour paper and I’m kicking myself now reading the brief where it says use coloured paper. However further down the page it does say leave gaps to let the white break through so it’s easy to see how I got confused. I set up a colourful group of fruit which included a quarter of watermelon, a red apple and two ramhutan or ‘gno’ as they are known in Thai, concentrating on creating a group of contrasting colour and texture I set them on a stainless steel reflective plate which I bought with the intention to use in the earlier exercise ‘Shadows and Reflected Light and Shade‘, and placed the composition on a piece of folded cloth used to make Thai monks robes. First of all I lightly sketched in the main shapes of the group doing my best to fill the paper including the main shapes of the cast shadows on the cloth underneath, I think this was my best attempt at filling the paper so far. I then started to block in the darkest areas using a sketchy hatching technique, I’m trying to be more fluid in this part of the course and I think I’m doing well so far. 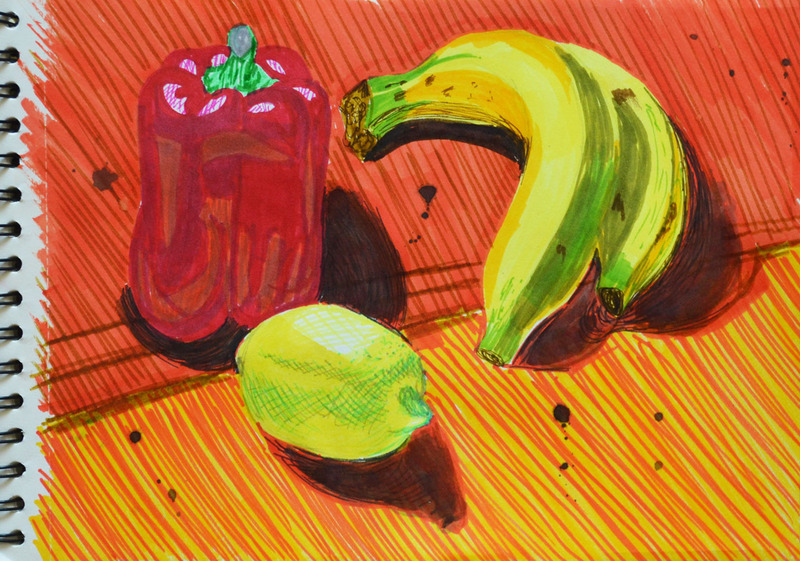 From there I went on to sketch the light areas in a different colour, on the watermelon and apple at least. Once the initial layers of colour were blocked in I worked back over them to strengthen the tone using related colours on each object to strengthen the tone. On the flesh of the watermelon I used pink, red, a very dark red and a dark blue to create shadow as well as black and white for the seeds. For the skin I used a dark green a light yellow and a grey-blue colour. For the red apple I used ultramarine, red, orange and pink for the skin and green, yellow and orange for the core, these colours worked really well together. On the rambutan I worked from light to dark then back again and they were probably the hardest thing I’ve drawn so far. 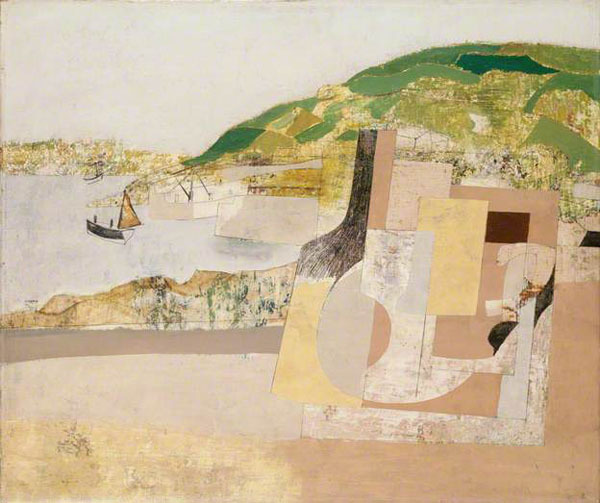 For these two objects I used all of the above colours but it took me a very long time to build up the layers and to get them looking anywhere near they did in real life. Although they are not perfect I really love the effect I have created while working on them. They are a very irregular shape and yet I have still managed to make them look round and spiky. 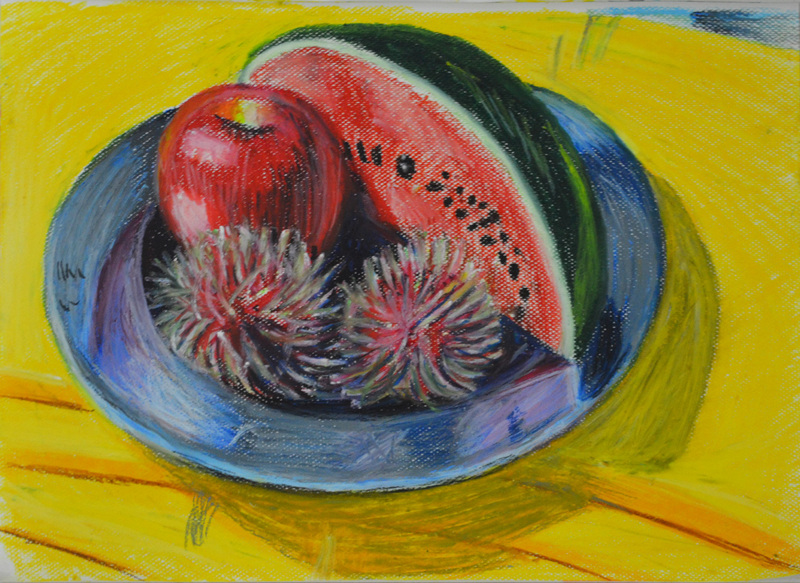 Same again on the plate, because it was so reflective I used a lot of the colours utilized for the fruit plus a light blue, grey and white. 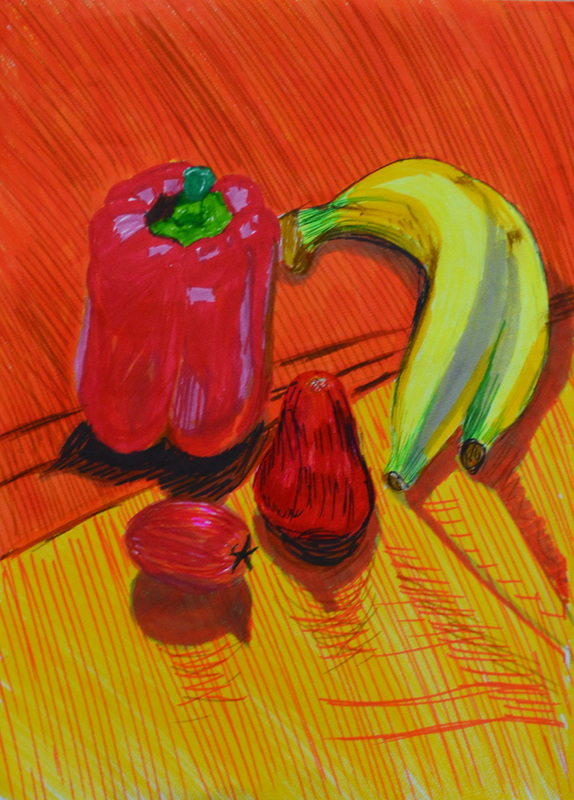 This is the first time I have worked with oil pastels other than experimenting and I found that you have to know when enough is enough for danger of messing up your drawing. 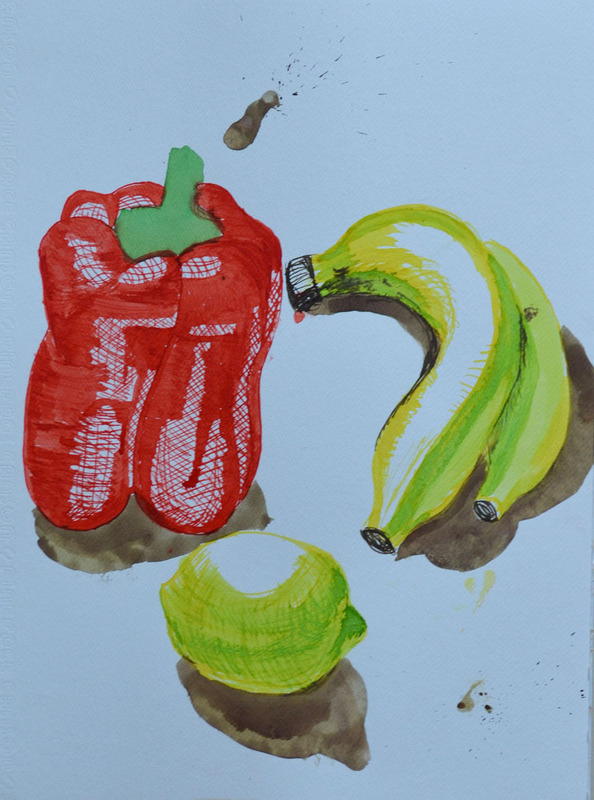 For this exercise firstly I was to select some pieces of fruit and vegetables and draw each of them individually in my sketchbook in a medium of my choice paying attention to the shapes or planes that make up the objects outline. I decided to use colour pencils for this exercise as I needed more practise and have yet to get used to blending. 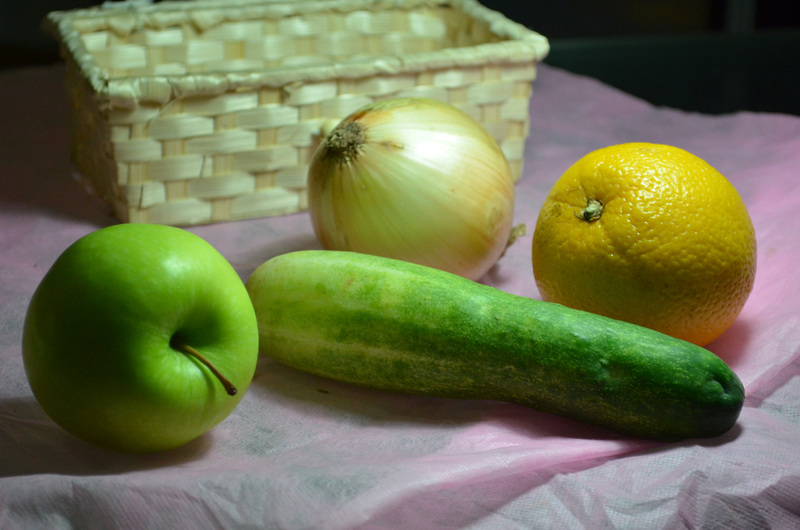 I initially chose an onion, a cucumber and some strange Asian mushrooms for my composition but all that was to change. Then I was to write my thoughts and ideas next to the sketches including some notes about tonal values and ideas about the arrangement of a composition and use a view finder to crop some of the shapes in different positions. As a view finder I used my camera sometimes looking at a photo of the composition you notice things that you wouldn’t notice with the naked eye. 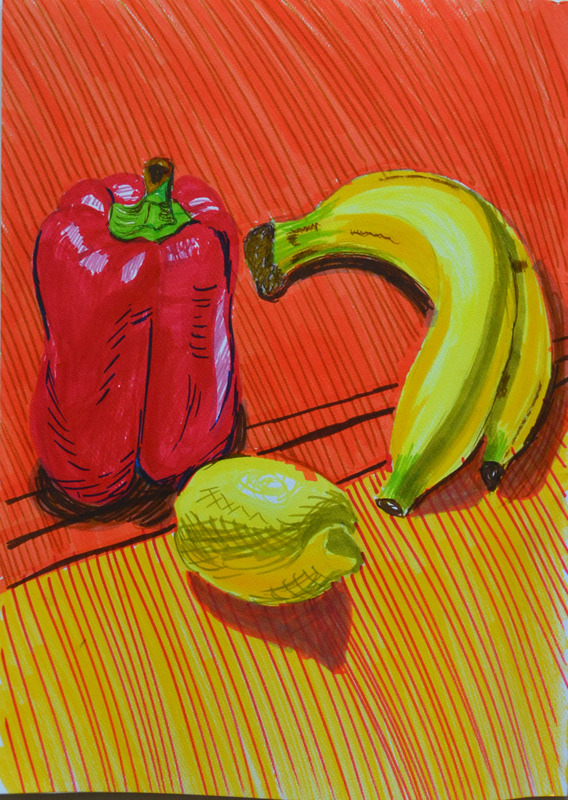 It took me at least two hours to decide on the composition and what fruits and vegetables to change and the angle from which I would draw from, trying my hardest to stay away from similar layouts to the compositions I had used in earlier drawings. I swapped the Asian mushrooms/toadstools for an orange and an apple as I could use them in different positions and together with the onion the three spherical objects looked great with the cucumber. They also picked up the reflected light from the pink cloth that I decided to use as a backdrop very well. 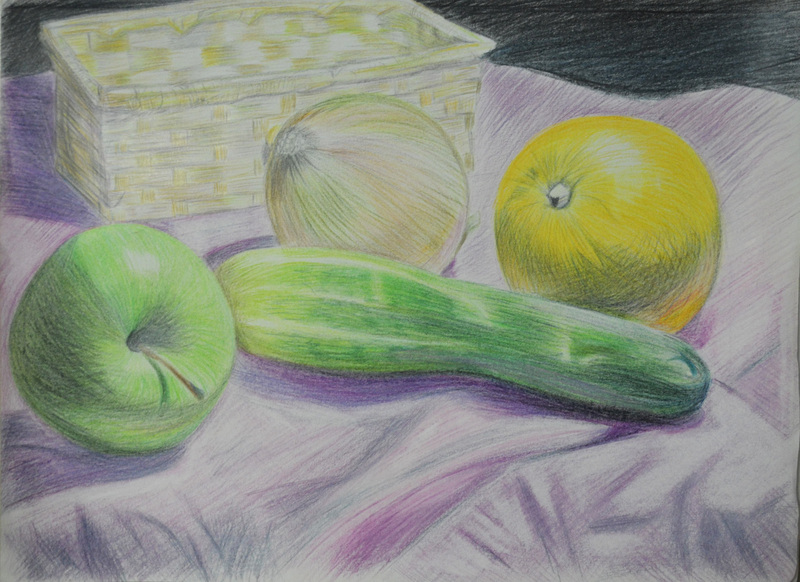 On an A3 sheet of paper I lightly sketched the outline of the objects with a 2H pencil and began to hatch working on the cucumber first but not finishing and then moving to the other objects to see how the cucumber looked against them this helped me decide on tone and colour of the cucumber being the more awkward of the 4 objects. 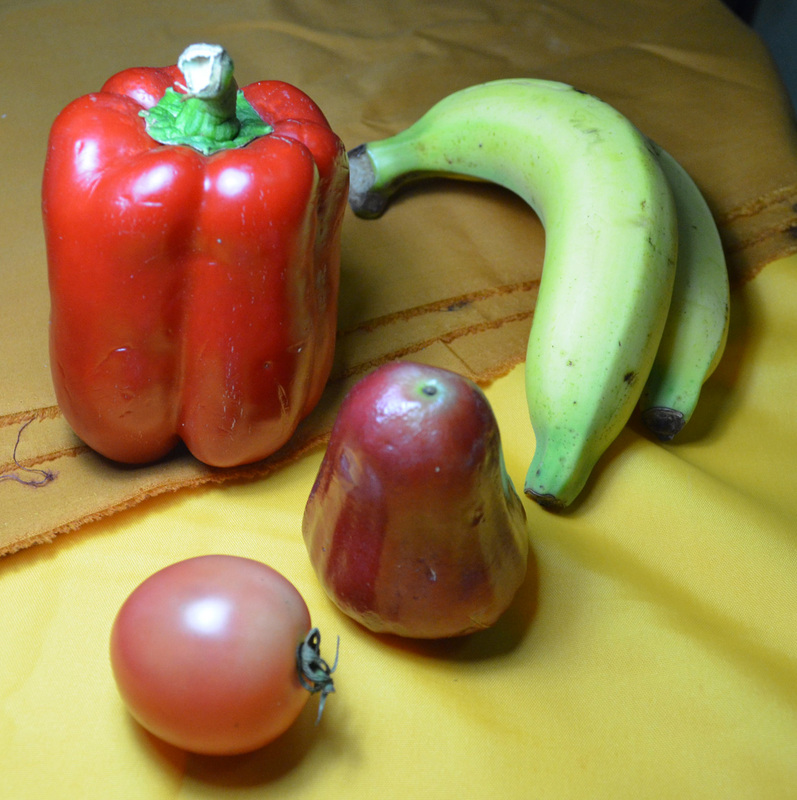 After working on the other 3 objects I came back to the cucumber which I had to reshape a little bit with an eraser. I’m quite happy with the finished drawing I think the composition fills up the picture plane quite nicely, and I think I did quite a good job with the hatching which I think is more fluid than anything I have done before. Probably the most difficult part of the drawing is the props I used the slightly transparent cloth and the straw basket. The only think I am not satisfied with really is my photo skills and will try and get a better photo to send in for assessment.